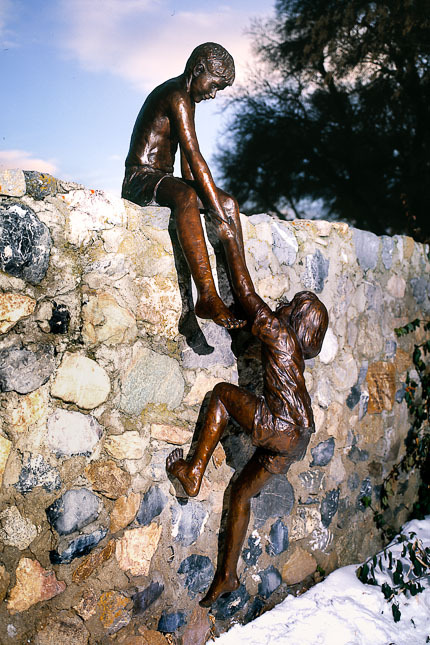 Being the first one up, he now reaches down to help her onto the wall. Older siblings are our first supporters, and despite the jangling, our first defenders when push comes to shove. Having gone before us, it is they who open our gates into the wider world. Those of us who have them know that they are the trail breakers. Beyond their helping hand lie the beginning of broader venues outside the everyday-realms of new adventure and childhood discovery.